We sold our first Solaris within days of it's arrival. We now have a 2nd machine on the floor. If you are interested in Babylock's new sewing/embroidery machine with the SUPER BIG hoop, let us know so we can place an order for the machine and cabinet for you. 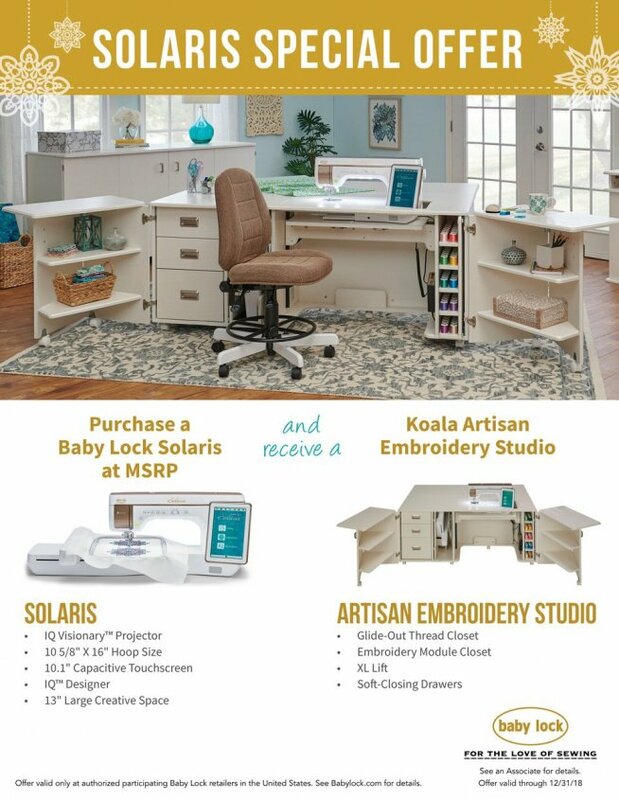 Purchase a Baby Lock Solaris at MSRP and receive a Koala Artisan Embroidery Studio at no additional charge! Offer valid exclusively through authorized and participating Baby Lock Retailers in the United States, October 1, 2018 – December 31, 2018. *Free Koala Artisan Embroidery Studio base model includes XL Lift, Left & Right Front Doors, Notions & Fabric Palettes, three drawers, Thread Closet, Embroidery Module Closet and hoop storage. Options and accessories such as extra height, Outback Leaf Extensions, Outback Shelves, Door Shelves, machine insert, and chair may be ordered at Koala’s National Promotion Base Price. See Koala’s Retail Price List for details. Normal Koala lead times apply.